E-invoicing is an ideal way to secure and automate processes (supplier and customer invoices) that are often time consuming and low in added value. Manual processing can be both lengthy and tedious, sometimes resulting in oversights that can cost you dear, in penalties for failure to meet payment terms, for example. Document conversion (electronic archiving), etc. Key rules to know and apply in order to be in good standing with the tax authorities. Based on the provisions of European Directive 2010/45/EU, amending Directive 2006/112/EC, the TX2 E-invoicing solution is available as a hosted solution or under licence. This solution allows you to dematerialize invoices in EDI or PDF format (including signed PDF), doing away with the costly processing and archiving costs associated with paper documents. The resulting e-invoices then appear in the form of either structured files (in EDI format) accompanied by a summary list generated automatically as part of the dematerialization process, or PDF files with an electronic signature certified by Chambersign. You benefit from all the features of an e-invoicing system, while we take care of its operation, monitoring and technical relations with your customers and/or suppliers. If you would prefer an on-site solution, this is available on licence. 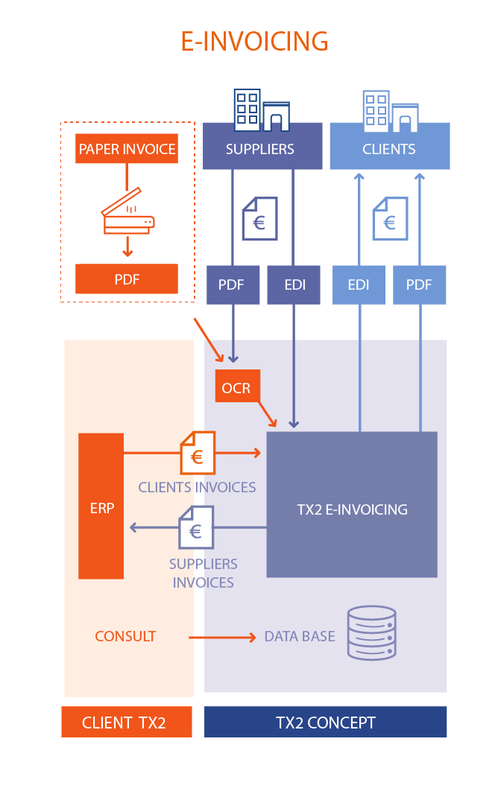 TX2 Concept is a signatory to the Interoperability Charter for E-invoicing solutions. Our TX2 E-INVOICING solution is GS1 certified.